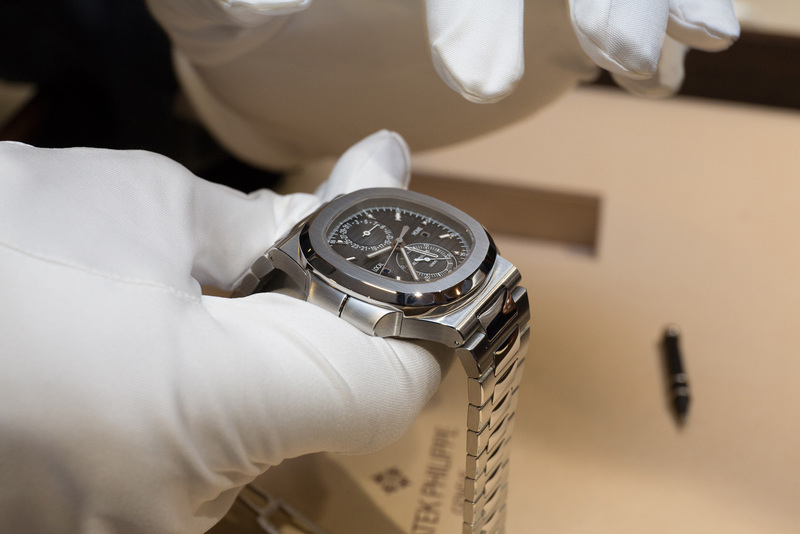 Fourth day of Baselworld 2014 watch and jewelry exposition has now ended for me and with just one more day to go I thought it would be nice to show some of the more popular novelties that everyone has been talking about – starting with arguably the biggest and most known watch brand today – Patek Philippe. 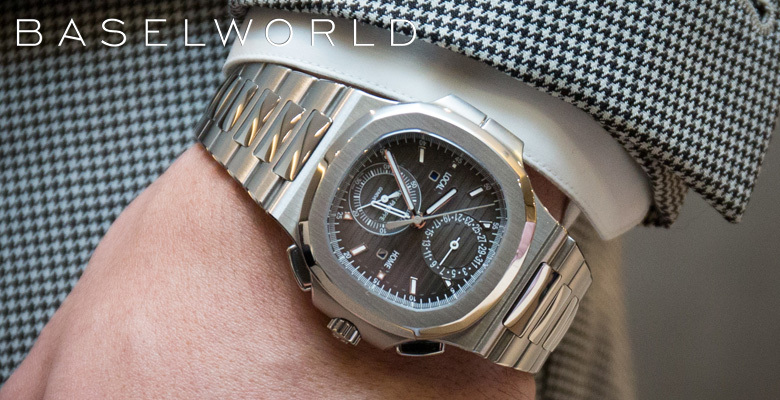 If you think Patek is boring you might want to rethink that after seeing their new piece in the Nautilus collection… But, before we get to that let’s take a look at my personal favorite for this year – the ‘tuned’ 5204P. Full name 5204P-011 it is a grand complications men’s watch that Patek introduced a couple of years back, but back then the reference ended in 001 and the face of the watch was white. This year Patek re-introduces the model but in a new color (black) that in my opinion changes the look of the watch entirely. It’s still Platinum and the movement is the same as in the previous model, I’ve put the 2 versions together back to back so you would most definitely not tell which one is the new reference. Now, if you already know the reference I suggest you just skip to the next watch, but if you don’t it really is a very impressive watch and I’d like to share a little bit about it with you. 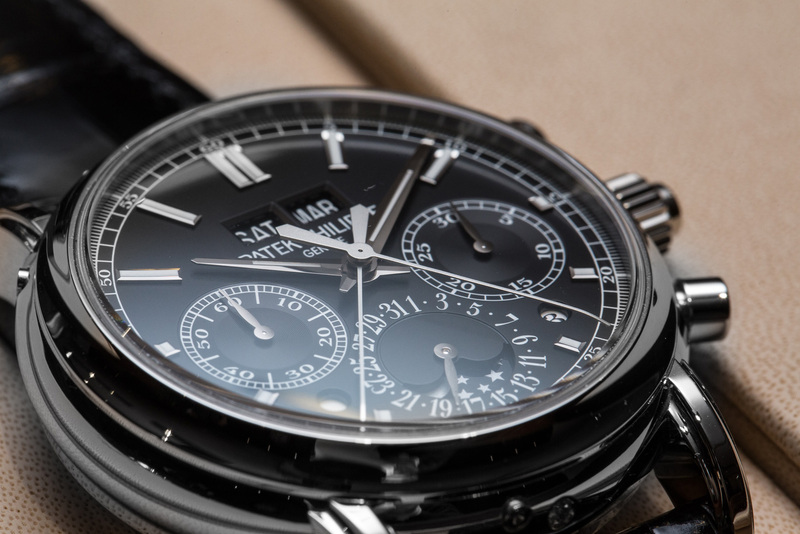 In short it’s one of the most elegant and beautiful perpetual calendar split-second chronographs I’ve seen. At 12 there are 2 windows displaying the day of the week and the month, at 5 o’clock is the leap year indicator and at 7 is the aperture for day/night indication. The subdial at 6 o’clock has 2 features – it displays the date as well as the current moon phase. 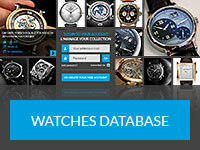 The main time is displayed on the main dial with the running seconds at 9 o’clock. As for the chronograph function there is a 30-minute indicator at 3 o’clock and the seconds are located in the main dial. Movement is a very complex manually wound beauty made of 496 parts with a 65 power reserve. Instead of the usual Geneva Seal Patek introduces their own Patek Philippe seal which is arguably much more prestigious and hard to achieve, so that is a good thing ? 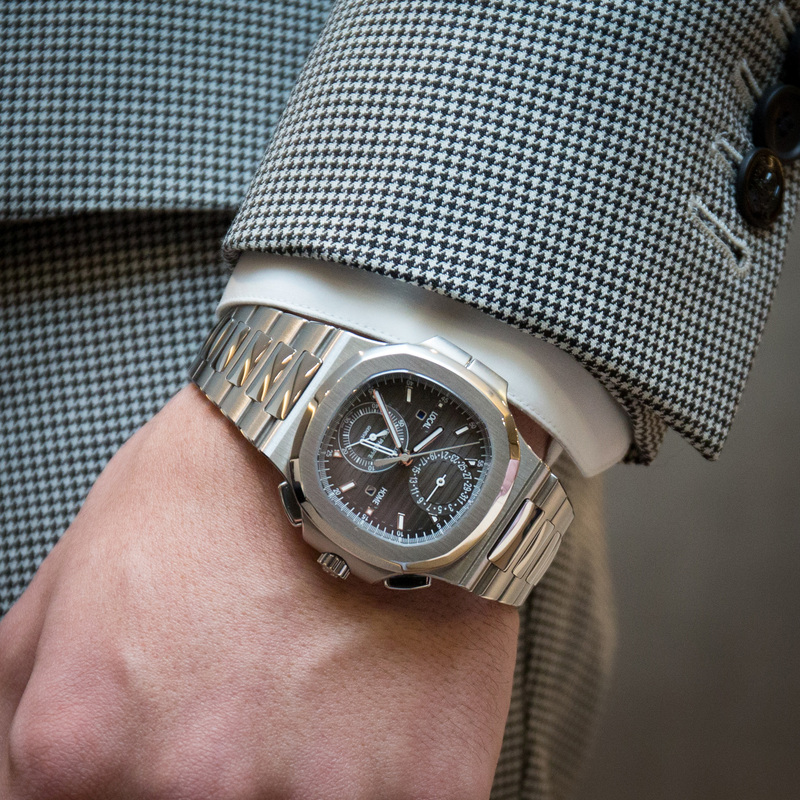 Now the second novelty, a true novelty must I say, is the new Patek 5990 Nautilus. 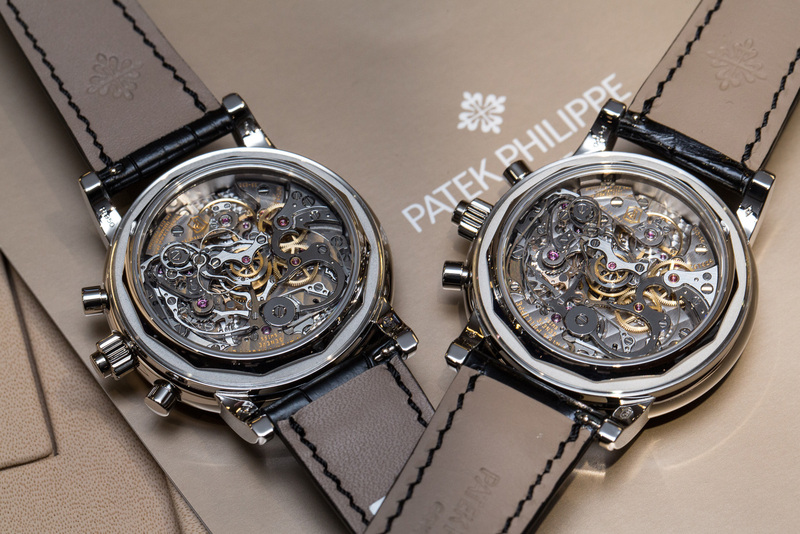 This is definitely a piece that catches anyone’s eye, made completely of steel Patek came up with a new movement to house all of the complications featured in the watch in the Nautilus casing. 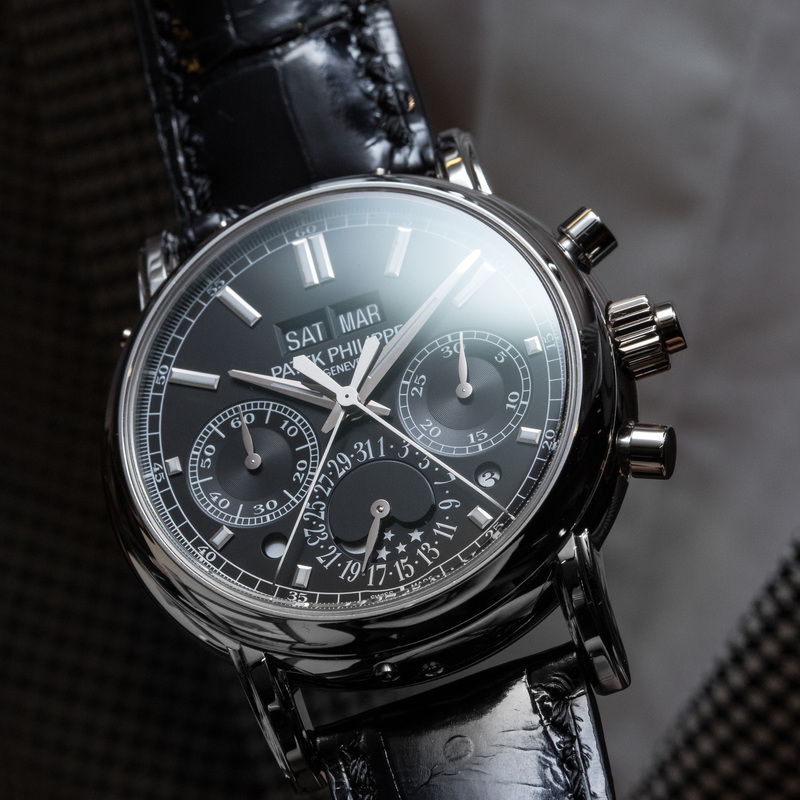 Apart from the regular time it also has a chronograph function, with the 60-minute counter at 6 o’clock (that at first looks like a running seconds indicator). 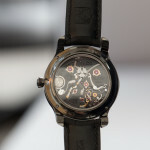 Apart from that there is a date wheel at 12 o’clock and a (wait for it) second time zone displayed with a skeletonized hour hand that appears from the inner side of the main hour, and just so you know whether it’s day or night in your local city and back at home Patek puts 2 different day/night indications in 2 apertures at 9 and 3 o’clock. To change the time for the second time zone PP added 2 pushers on the left side of the casing. 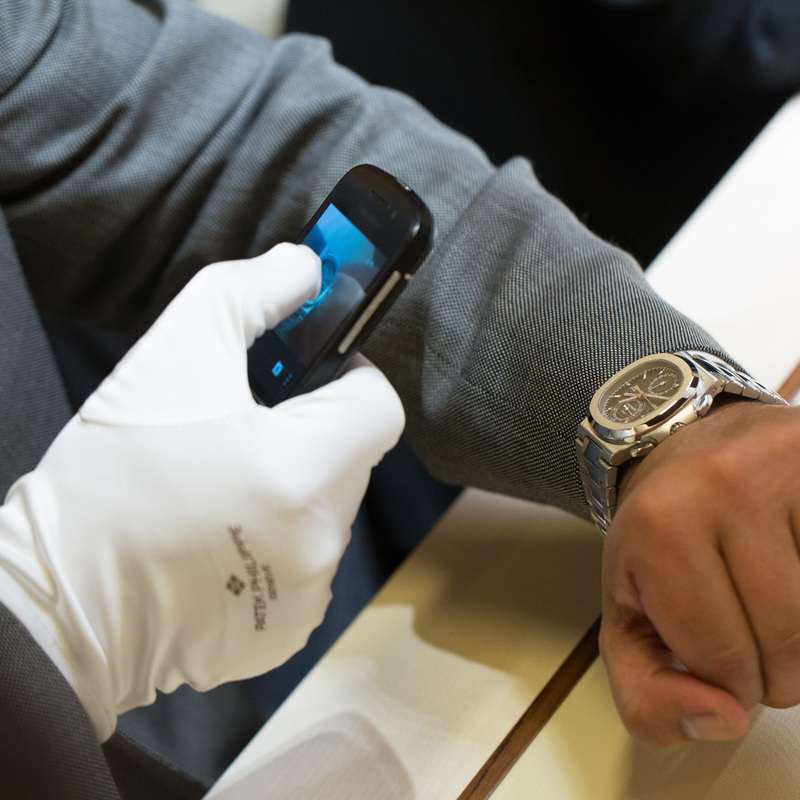 I see an advantage here as you no longer need an iPhone pin to change it but the disadvantage is that if you get a little bit too active and twist your wrist you might accidently press one of the pushers and change the time back home. Apart from this point I don’t see any negatives in this watch, even with these complications the Nautilus dial doesn’t look very busy, and just in case you decide to press all of the pushers at once nothing bad will happen and the movement would not break. Overall this watch is definitely worth taking a good look at even if you are not (like me) a fan of bracelets. 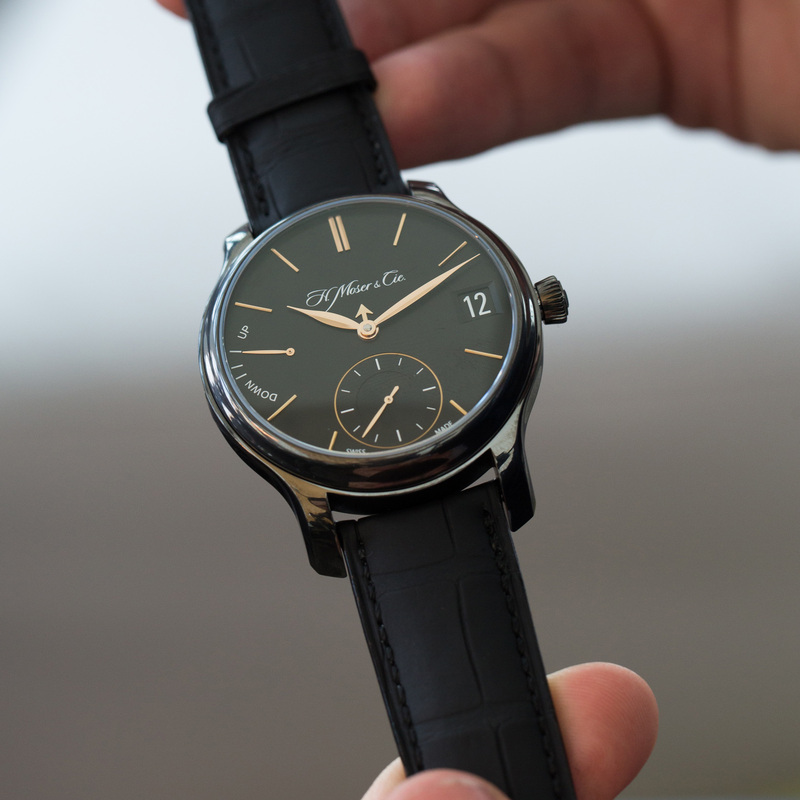 Now if you are a fan of traditional watches but maybe would rather go for something less mainstream here is a novelty from H. Moser & Cie, a brand that is very famous among the collectors who really appreciate the watchmaking side of horology and aesthetics as well as simplicity. The new Perpetual calendar black edition offers exactly that – a very nice complication housed in one of the simplest and most elegant timepiece designs, but with a twist – the color of the watch. 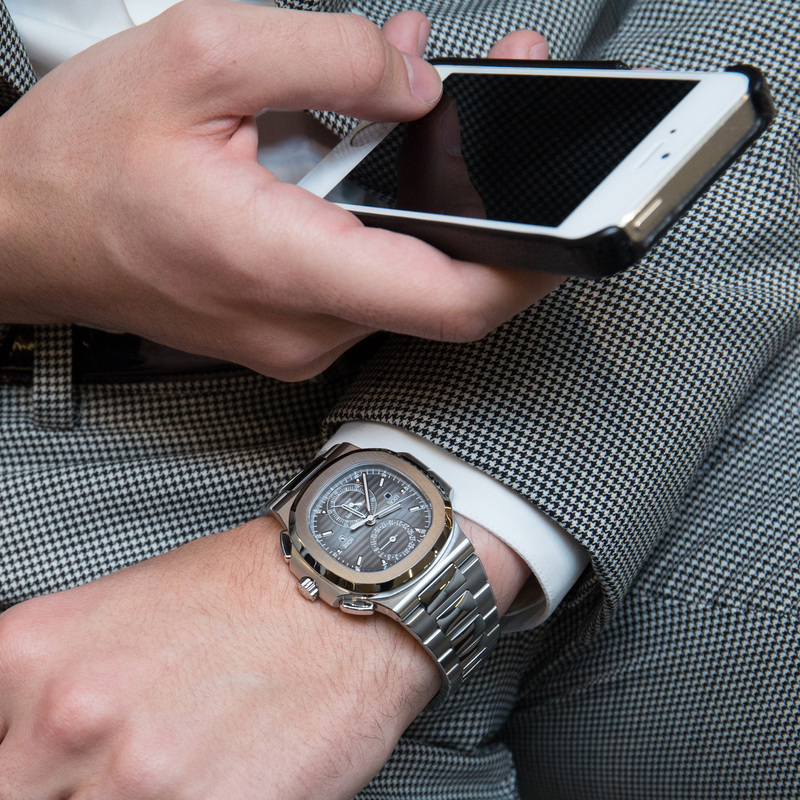 Made of black Titanium the 40mm casing looks very elegant yet carries a 7 day power reserve in it (impressive, innit?!) 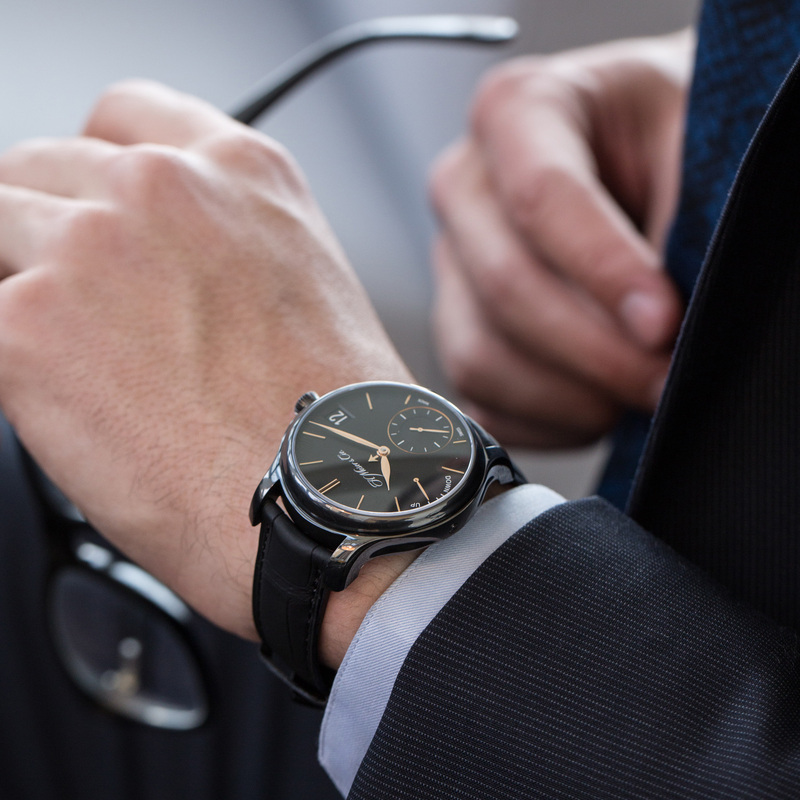 By looking at the dial you might wonder where the calendar is – the date is displayed in the aperture at 3 o’clock while the month is discretely indicated in the center of the dial. At 9 o’clock we can see a power reserve, which doesn’t tell you the exact numbers (just like the month or hour/minute indication) but that is the beauty of this minimalistic yet complicated timepiece. And as a perpetual calendar should also count a leap year you can find that indicator on the back of the movement because let’s admit it – it’s not a function we need daily ? So that was it for today, and I hope you’ve enjoyed the article and are looking forward for the last write up tomorrow! 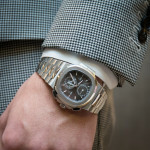 Credits @ Photos by Adam Priscak and James Cole for DreamChrono Watch Blog.